We'll end tonight by hearing from a victorious Michael Bisping. Don't forget you can watch the best action from across the evening by clicking on the highlights tab and choosing from the best clips. Thanks for following UFC Fight Night on BBC Three. It's been a pleasure. UFC president Dana White: "Anderson looked really good tonight for a 40-year-old guy in a five-round fight who has fought once in two years. "Bisping has never won a world title but he has been around here for a long time. Bisping comes to fight. He never backs down. "It is one of the reasons so many people love to watch him fight and respect him." Mike Gibson: What did I say?!? :-) Bisping will earn the decision. Sprout: I had it 48-48 with Anderson 10-8 in the 3rd. But great job Bisping. Addressing his fans back home, he said: "Brazil - what can you do? You saw the fight. I thought it went differently. I thought the mission was completed. It was not." The crowd surely played their part in Bisping's victory. What a spectacle this was for the neutral. Blood pours down Michael Bisping's face as he talks about the greatest night of his career. He tells Dan Hardy: "I wanted this fight my entire life. You guys give me the power, you guys have been in my corner the whole time - thank you from the bottom of my heart. "Things were said between me and Anderson before the fight but I worshipped this guy when I was younger. Anderson, you cannot measure the respect I have for you. "I did this for my family and I also did this to represent Great Britain." That's Bisping's future perhaps, but what next for Anderson Silva? Was that his last fight? Bisping is being interviewed. You can see the war he has been through in his bloody and battered face. What a win. The biggest of his career. Will he get a title fight next? All three judges score it 48-47 and Bisping has beaten Anderson Silva! Quote Message: Michael Bisping was keeping the pressure on but Anderson Silva landed the cleaner, more devastating shots. So much happened in those 25 minutes - where do you take that fight? 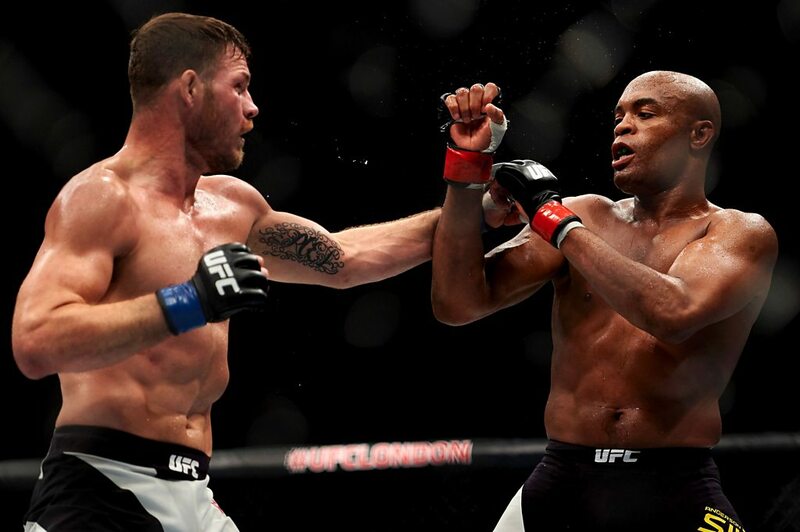 Michael Bisping was keeping the pressure on but Anderson Silva landed the cleaner, more devastating shots. So much happened in those 25 minutes - where do you take that fight? Silva looks the more likely to win and a big kick almost brings it. Bisping is retreating, his legs look shaky. Can he survive? Quote Message: Michael Bisping is giving ground but he is still in the fight. Michael Bisping is giving ground but he is still in the fight. Quote Message: Bisping is in retreat! Anderson now like an avalanche pouring forward onto Michael Bisping. Bisping is in retreat! Anderson now like an avalanche pouring forward onto Michael Bisping. Blood trickles down both the fighters' faces as they call time to assess an injury to Michael Bisping. The crowd are livelier than ever to see the Englishman return to the fight. Visually Silva looks in far better condition than Bisping whose face is a mask of blood. Here's the knockdown from the second round.